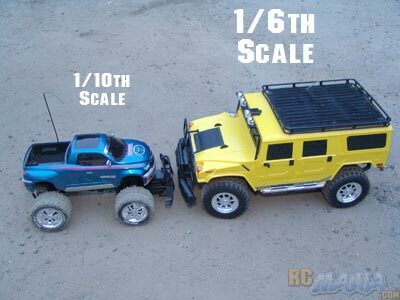 The truck on the left is a Nikko 1/10th scale (the usual large size) monster truck. It is lifted and has huge oversized tires. 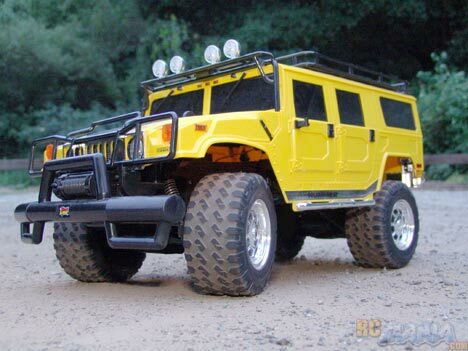 The Hummer isn't even a monster truck, it just has slightly raised suspension and moderately large tires, and yet it still towers over the other truck! 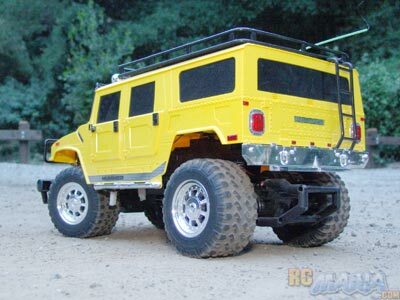 The detail on this Hummer is amazing. They have all of the little rivets and shapes in the body, plus reflectors, chrome accents, door handles, side mirrors, and a full roof rack with a ladder on the back. The lights on the truck really work! There are headlights, a whole row of floodlights across the front of the roof, plus brakelights, and they all automatically work as you drive. The tires are soft rubber with decent tread, so they will probably grip terrain pretty well. The truck also has working suspension that doesn't move a whole lot, but should be soft enough to absorb some good bumps. The fact that a full-size 7.2V battery is required means this truck should have some power, so I'm anxious to try it out! All you have to do is install the antenna tube on the roof, charge a battery, put a 9V in the transmitter, and you're off. For such a big RC, this truck maneuvers around nicely. It has true digital proportional control, so you can go really slow or turn as little or as much as you want. The steering is very good and the transmitter controls are smooth. Top speed is modest at around 8mph, but to be honest, I'd be worried that it would flip over in turns if it was much faster, because it's kind of high off the ground. All of that ground clearance and the soft suspension, however, allow it to handle some pretty rough terrain. It's not an off road race truck, per se, nor a rock crawler, but it will gently climb over or push through obstacles that smaller RCs simply can't. I'm really satisfied with this truck. It looks great and has a good set of features. A little more speed would be nice, but its ability to truly go offroad and tackle unprepared makes up for this. I'm thinking about keeping this one and making a project out of it!